OK, you probably know something about the current state of the housing market here. You’d really have to live under a rock not to. You probably also have an opinion about who is at fault in this situation. It’s human nature to find a scapegoat. If something bad has happened (a fender-bender on the freeway, a ball dropped at the office, that time I ate so much steak and Gruyere mashed potatoes I almost threw up), it was someone else’s fault (the other driver, a coworker, my husband for making such a delicious, large meal knowing full well that I am like a goldfish and if you feed me too much I will keep eating until I die). Part of my own personal nature is that my default setting is ‘Guilt’. If something bad or disastrous has happened that is in any way related to me, I automatically assume that I’ve done something incorrectly that has caused this problem. I’m a master of self-flagellation. It’s actually probably insanely arrogant to think that I had anything to do with the crashing down of the entire national housing market, but I would be lying if I said every time a client who bought in the last five years with me has called and asked me about the value of his or her property I don’t feel at fault for the fact the property is now worth less than he or she paid for it. OMG, if only I was a better Realtor, I would be able to see the future and would have told all of my clients, family and friends to sell all of their properties in mid-2005 and then rent until now when they could buy again. Also I should have been a good enough Realtor to see the future and tell myself this. ATTENTION PROPERTY OWNERS OF ARIZONA…. Your house isn’t worth what you paid for it, or what you owe on it. It also isn’t worth what you hope it is (which is less than you paid for it, but still more than you could actually sell it for right now). Even if you bought in 1995 you most likely refinanced and pulled some or all of your equity out to remodel your kitchen or buy a boat in 2005 (I remember when we did that [kitchen, not boat] and the day they told me I could get a check for $20,000 and my mortgage payment WOULD GO DOWN because my interest rate was lower and I was so blissfully amazed with how awesome the world of home ownership was… ah, yes, the happy days before I realized I was the cause of all economic downturn). Even if I’m wrong, and your house IS worth more than you paid for it because you bought in 1972 and paid off your mortgage and own it outright, you still think it’s worth way more than it is because you remember hearing what your neighbors sold for in 2005 and that’s the number you are convinced you can get now. But you won’t. I know, I sound harsh. But like I said, I’m ripping the band-aid off. I’m like the lady with the waxing strips; she does it fast and all at once (or the nurses at the pediatrician with the four shots, they get two nurses and stab those chubby little thighs two at a time real quick, I could go on and on with these metaphors). The point is, knowledge is power. No, it’s not what you want or hope for, but it is what it is, and you should know. Graph is from The Cromford Report. So this is just Gilbert, but bear in mind that most metro-Phoenix cities are very similar. 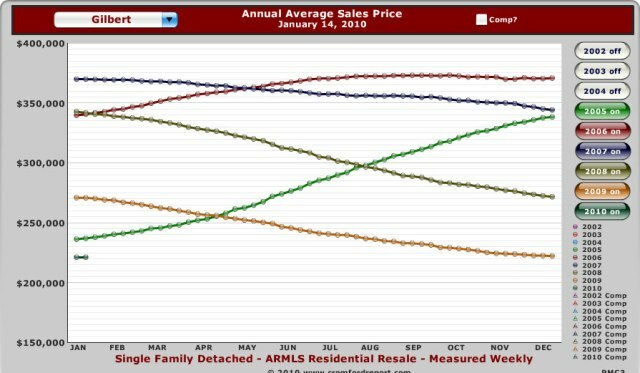 Take a look at that light green line that represents average sales price in 2005. See how it looks like the hill that Jack and Jill went up? And 2006 (in red) is still going that direction? And then 2007 (blue) is levelish until it hits 2008 (muddy green) and Jack falls down the hill (Jill comes tumbling after in the brown 2009). Take note of where that tiny little 2010 teal colored line sits. It’s down below 2005. I know, Dear, go ahead and poor yourself a glass of wine and take a seat. It’s not pretty, but it’s the truth. Well, I feel better at least.. but I’m sorry for everyone else.. great post and I think it *is* important for people to understand just how the market has gone the last few years..
nice post! I like the graph and the no BS approach. My graphical analysis of the current situation looks more like an empty, very large still-cold pitcher of margaritas. Good thing I like my little home. I’m going to be in it for a while. I’ve known this all and yet the graph helped. The picture plainly stated I’m screwed. Kelli – hope you are sharing that pitcher. . . . THANK YOU! I am going to direct every person that has these delusions to this blog. I am with you on the guilt part, but don’t be too hard on yourself, the entire industry and even the government played parts in the balloon and ensuing pop. Now we know what to do the next time that happens (hopefully it never does, but history tells us…), sell everything and rent.